Blue Pluto emerged from Sweetwater’s Academy of Music in 2014. 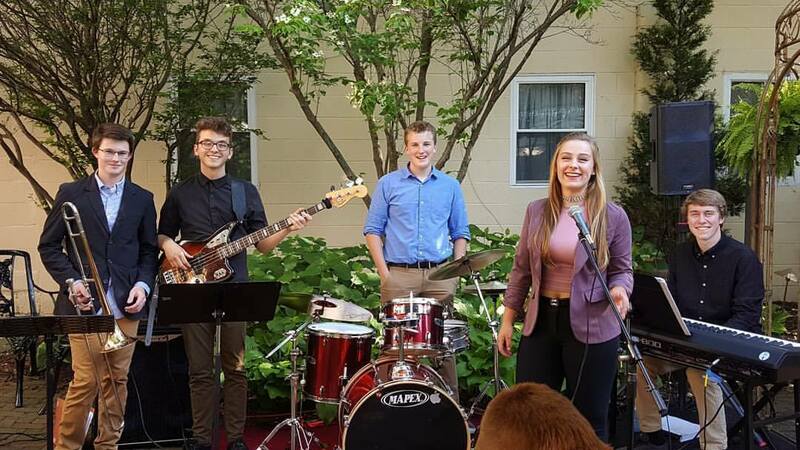 Instructor and coach Eric Clancy assembled a group of teens and convinced them that, together, they could knock out some pretty good jazz. Good call, Eric! Trombonist Sean Nolan models his playing on Count Basie, Troy Andrews, Arturo Sandoval, Miles Davis, Duke Ellington, and Snarky Puppy. Sean is a senior at Homestead High School, where he enjoys history and music. He competes nationally on the ski slopes. Bassist Sam Bellavance enjoys Charlie Parker, Dave Brubeck, Paul Chambers, Michael League, and James Jamerson. He taught himself guitar and also plays in a rock band. The Canterbury High School sophomore enjoys math and history. Drummer Colin Christenson models his percussion after Joe Jones, Peter Erskine, and Joe Morello. At Homestead High School, the sophomore plays football and in the jazz band. Aleena York is inspired by singers such as Amy Winehouse, Ella Fitzgerald, and Nai Palm. She studies Music Technology at the University of Saint Francis. Keyboardist Ethan Radke’s favorite artists are Robert Glasper, Chick Corea, Hiromi, and Cory Henry. As the #1 singles player, Ethan led his tennis team as a senior at Carroll High School this year. He plans to study engineering in college. The Rose Among Four Thorns!